After surmounting countless hurdles, a BC-related team rescues Wilmer Garcia from legal purgatory. 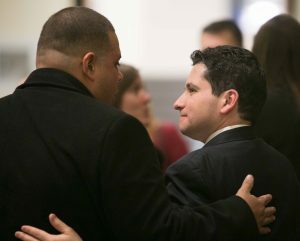 On February 20, Wilmer García came to Boston College Law School to celebrate the end of a thirteen-year-long exile. A legal US resident since age 10, García was deported to his native Honduras in 2005, after pleading guilty to simple drug possession, an aggravated felony according to the immigration judge who heard his case. Speaking to an audience of some fifty lawyers, law school faculty, and others, he recounted the tale of his deportation and the fight to bring him back—a tale of government misfeasance, pettiness, and arbitrary rules that, owing to luck and extreme perseverance, ended justly. Also speaking at the celebration were members of his legal team: Professor Daniel Kanstroom, founder and co-director of BC’s Post-Deportation Human Rights Project (PDHRP) of the Center for Human Rights and International Justice (CHRIJ); Heather Friedman and Jessica Chicco, PDHRP staff attorney and former staff attorney, respectively; and Ronaldo Rauseo-Ricupero ’07 and Brianna Nassif ’17, pro bono lawyers from Nixon Peabody. The effort to reopen García’s case and rescind his deportation dates back to 2010. Languishing in Honduras, where he spoke the language poorly, struggled to find work, and lived in fear of his neighborhood’s violent gangs, he discovered, via the internet, a 2006 Supreme Court ruling that simple drug possession was not, after all, an aggravated felony. Days later, he contacted PDHRP, which agreed to represent him. The US 5th Circuit heard García’s next appeal late in 2012. On Daniel Kanstroom’s advice, Chicco argued the case on due process grounds, in addition to more technical arguments. In court she evoked an image of the immigration system’s arbitrariness: the BIA receives a letter and, noticing the foreign postmark, throws it out unopened. Voting 2-1, the court overturned the departure bar, a decision that applies to three US states including Texas, a hotbed of immigration cases. García’s own case had years more to run, though. In 2014, an immigration court denied his motion to reopen, finding that García had taken too long to file it after the 2006 Supreme Court ruling, a rationale undermined in 2015 by another US Supreme Court opinion. For two more years García’s motions bounced back and forth between the BIA and immigration courts until, late in 2017, the BIA ordered the deportation case reopened. Until then, García had remained in Honduras, but if he wanted his deportation undone, he would have to appear in immigration court. Getting permission for his return to the US presented another obstacle. It took Brianna Nassif four months of unsuccessful motions, unanswered letters, and unreturned and disconnected phone calls to federal bureaus and agencies. García didn’t get the necessary papers until the day of his flight, and only after agreeing to be detained in the US until his hearing. After eight years of legal wrangling, the hearing on May 7, 2018 was practically an anticlimax. Representing García were Friedman, Nassif, and Danielle McLaughlin, of Nixon Peabody. Five minutes in, the immigration judge, without explanation, cancelled García’s deportation. García could resume his life in the US, as a legal permanent resident, after a 13-year interruption. Related coverage: Victory Brings Deportee Home–at Long Last, and BC News. 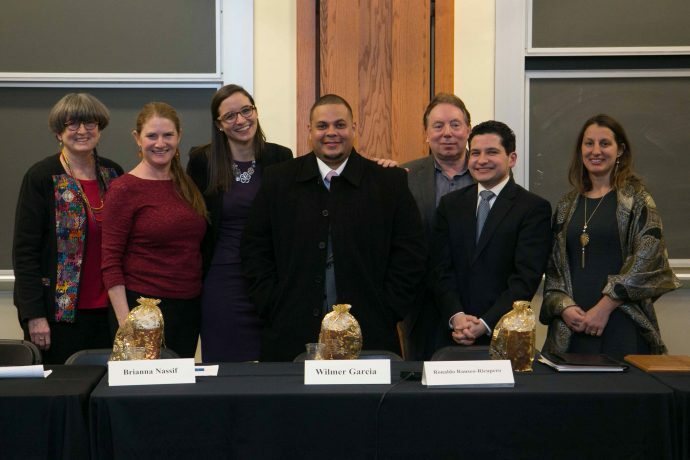 Photo, from left, CHRIJ co-director Professor Brinton Lykes, Heather Friedman, Brianna Nassif ’13, Wilmer García, Daniel Kanstroom, Ronaldo Rauseo-Ricupero ’07, and Jessica Chicco.